Focal point plantings come alive with style and flair when you add the statuesque blooms of this unique mix. We're sure this new introduction is sure to become a garden favorite, and you will be too when you see the flowers appear in succulent shades of apricot, pale yellow and soft orange. The stems are tall, straight and strong, making them ideal for sunny back borders and striking container gardens. This new strain is less prone to disease than other crown imperials. Butterflies and other pollinators are drawn to the bell-shaped flowers that are filled with nectar in spring, but deer won't bother them. 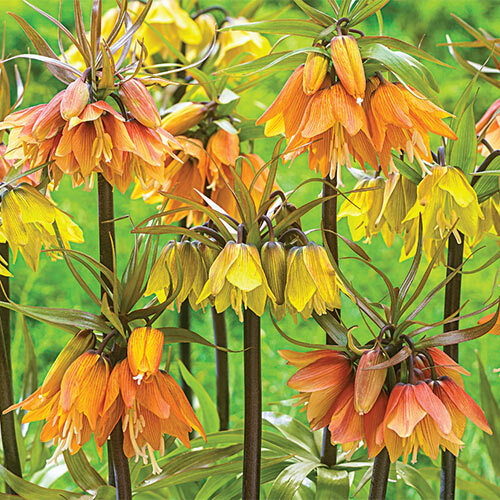 Crown Imperials naturalize quite well in the landscape, and will reliably re-emerge each year with increased beauty and vigor. Plant with 5-6" soil on top of the bulbs and 12-18" apart. Loosen soil well before planting.